While 2008 gave us animals and robots in the solar system with Fly Me to the Moon, Wall-E and Space Chimps, 2009 spoofed science fiction by bringing humans into the mix in such films as Monsters vs. Aliens and Planet 51. The first big 3D event movie of the year, DreamWorks' Monsters was an entertaining enough throwback to B-movie Sci Fi but it depended so much on the 3D format that without the technique there just wasn't enough to keep us interested. This is in stark contrast to this underrated and far more entertaining 2D flick that can also be viewed as a genre concept movie filtered through children's animation. However, unlike the action heavy humor of Monsters, our alien-centric Planet generates its laughs from circumstance, situation and opposites as it takes a traditional '50s drive-in B-movie but makes the human astronaut the creature from another planet instead of the population of little green, lovable characters. 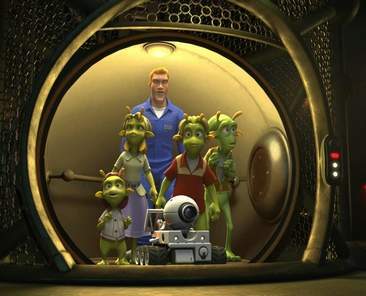 Although this time green didn't prove to be quite as lovable as Shrek did for screenwriter Joe Stillman and in its essence as a jokey '50s movie, it plays best to a post Back to the Future grade school and up demographic, Planet 51 still has a lot going for it thanks to the pitch perfect comedic work of Dwayne Johnson who continues to impress with each successive role. Seemingly right at ease as the cocky, handsome astronaut who's used to signing autographs for kids and making the housewives swoon, Chuck Baker gets a surprising wake-up call when he realizes that he's stumbled into some sort of backwards universe that finds him feared and persecuted as an "alien" while the aliens who send us screaming out of movie-houses act just like we do on Earth. Stuck hiding out with teenage planetarium assistant Lem (Justin Long) along with his dog like robot sidekick “Rover” who goes after rocks like puppies chase balls, Chuck tries to sneak back towards his rocket in order to return home which becomes far more challenging since the entire town including military official Gary Oldman and professor John Cleese have everything surrounded. While fitfully amusing, it does begin to run out of plot near the final act of the film as the rather ingenious premise can only take you so far and kids aren't liable to get all of the Baby Boomer humor. 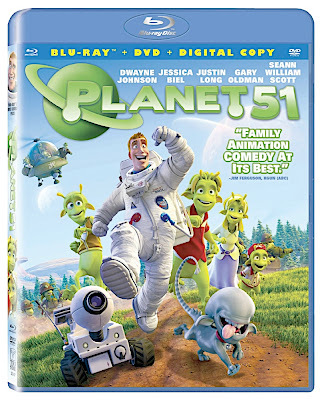 Despite this, Sony's Planet 51 isn't in the same league as the studio's vastly superior 3D effort Cloudy With a Chance of Meatballs. Like Planet, Meatballs was unfortunately also one of the underrated titles in 2009's year of superlative animation including Up, Coraline, Fantastic Mr. Fox, and Ponyo just to name a few. Yet, fortunately, Planet is still high quality animated entertainment that should be far more interesting for parents to sit through than most children's fare. And likewise, for those who know the genre and era it's skewering particularly well, it's especially fun to go beyond the surface level influences of Monsters characters like the blob and the skyscraper tall woman to really see how much science fiction as well as '50s and '60s pop culture gets used throughout this interplanetary and very green blast from outer space past.